Don’t let their small size fool you. 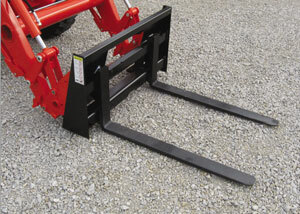 These pallet forks are designed for compact tractors up to 50 horsepower equipped with a front loader. Excellent for moving bulky, bagged or palletized materials quickly and easily, saving time and effort. Pallet forks are rated at 2,400 lbs. Note: Rated lift capacity is based on a pair of forks with no more than 1/2 - load per fork and load no more than halfway out on each fork.